Braid bands, also referred to as braid sleeves or braid ferrules, are used to secure woven braided sleeves that cover corrugated metal hoses. 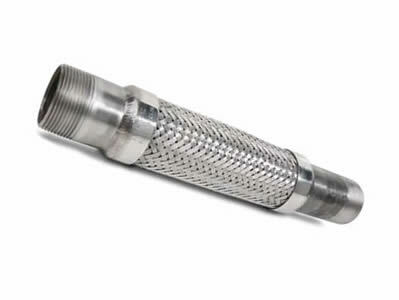 The braided sleeve provides strength to the corrugated metal hose, and also protects the hose from abrasion. The AMFM Braid Band retains the braided sleeve against the hose and allows the two parts to be welded together. Understanding the sizing process for AMFM Braid Bands is a crucial step in selecting and ordering the right parts. Today, we’ll walk you through the steps to correctly sizing your brand bands. The AMFM Braid Band was designed to accommodate the variable factors in hose fabrication. It is a solid band manufactured for 3/16” through 2” hose sizes. Braid Band (ID) sizes are manufactured in 0.150” increments from .420” through 3”. The AMFM Braid Band is primarily manufactured from 304 Stainless Steel, with availability in 316 Stainless Steel, Copper and Monel. The incremental sizing allows the fabricator to select the best width based on the OD of the hose and type of braided hose covering selected. OD of hose and braid can vary by manufacturer. The use of standard braid, double braid and/or braided braid sleeve all influence which AMFM Braid Band works the best. Standard and non-standard variants of the AMFM Braid Band are available. The AMFM Braid Band can be manufactured to serve your specifications for any application. Impression Branding – Braid bands fit over hose and can be imprinted to reflect the necessary information or your company logo. AMFM Braid Bands must be sized for each individual hose and configuration, and are manufactured to “fit size.” Fit size can only be accurately determined at the time of manufacture. The AMFM sizing gauge was developed exclusively for use with the braided metal hose to indicate the appropriate AMFM Braid Band needed. Selecting the size from catalog dimensions from the hose manufacturer or measuring the hose without consulting the factory is not recommended. More than one “standard” size increment will fit a braided hose with nominal difference, except in smaller hose sizes (under 1”). Double braid hoses generally require the equivalent increase of approximately three standard sizes over the single braid size. AMFM Braid Bands offer very close consistency, and in some instances can exceed that of the hose. This may require alternate bands when a very tight fit is used that leaves no ability to consume a minor increase in hose diameter. Specific tolerances are established for each series of braid bands. These standards are set to ensure each braid band is manufactured to the exact fit size. This ensures that each braid band fits properly on your hose. “Edge protrusion” refers to general edge condition. Options include single point protrusion or burr, with specification maximum of .0075” and .005”, respectively. All edges are burr-free and square. With reference perpendicular to ID, part edge variations can deviate in parallel, part square, or basic material irregularities. Variations can involve a single edge or both. Specification calls for a maximum “gap distance” when measuring with reference to ID surface and corresponding perpendicular edge. Gap specifications vary from .010” to .040” depending on part size and material. To learn more about sizing AMFM braid bands, contact us or see the complete parts catalog for more information.